One of the things on the minds of all advisors and clients is the question “Will I outlive my Savings”. Indeed a fair question given the advent of the Baby Boomers. They will live longer, have saved less and are more indebted than prior generations. The discussion on the table today is simple. 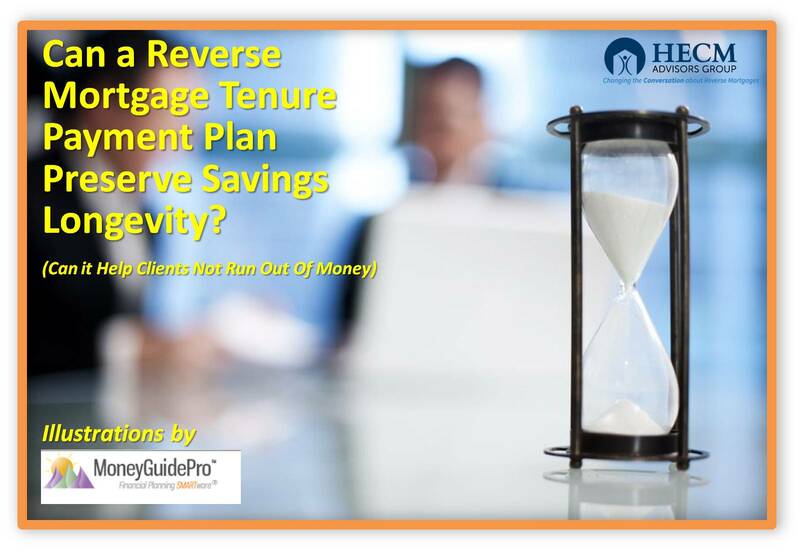 Can we Increase Portfolio Longevity with a Reverse Mortgage? For part of this answer, we asked one of our industry partners; Security One Lending to help provide some answers. 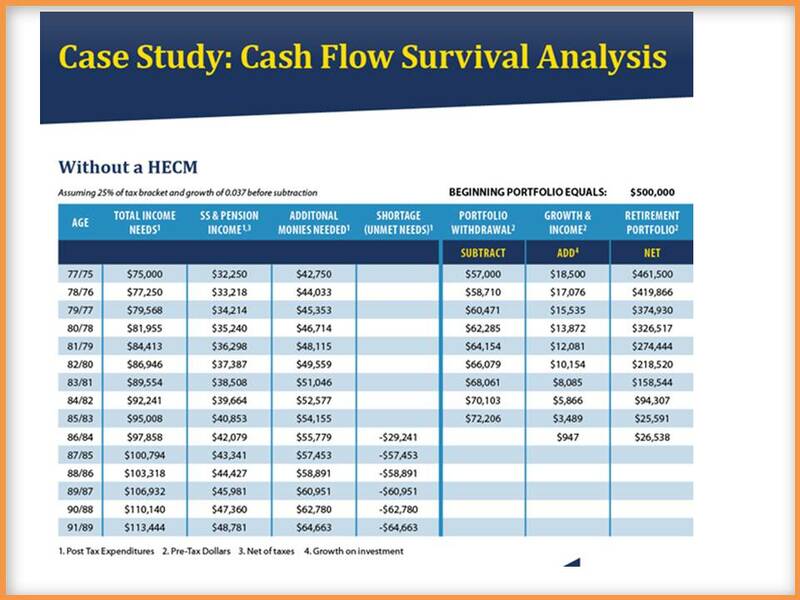 They in turn asked the financial planning software leaders Money Guide Pro to help us do a simple analysis to see if the Reverse Mortgage would make a difference. 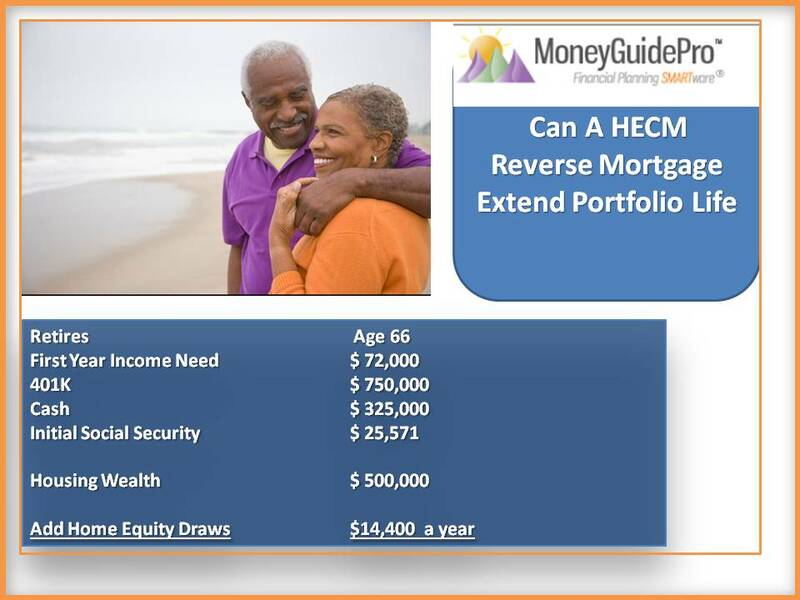 HECM REVIEW: The Home Equity Conversion Mortgage (HECM) aka as a Reverse Mortgage allows a homeowner over the age of 62 to convert a portion of their homes value into tax free money. 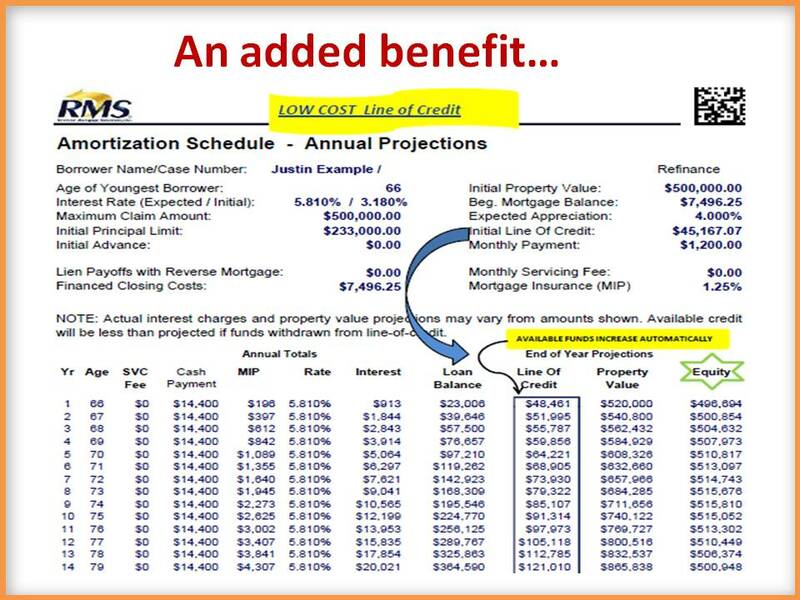 There are no monthly loan payments required, there are no standard income or fico score qualifications and they owners always remain on title to the home. 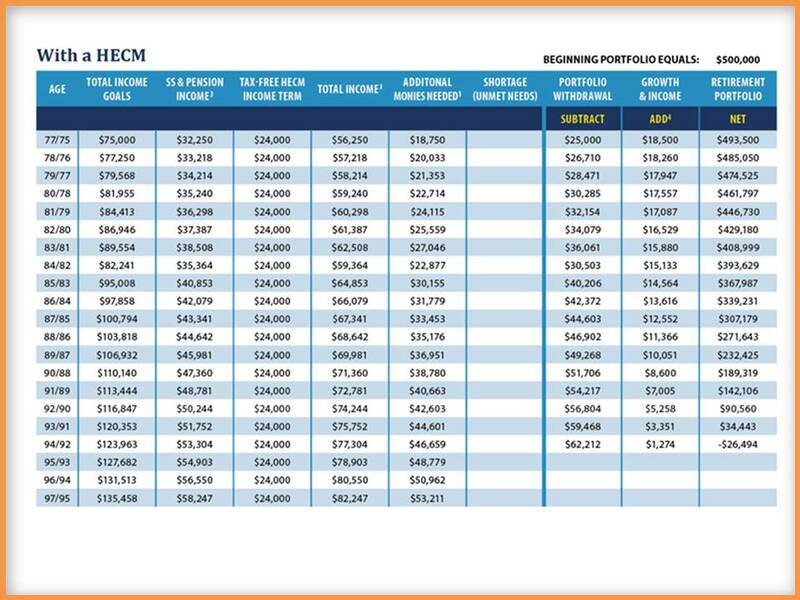 The following Illustration looks at a Tenure Payment stream. Here is our client. They have not done too bad in saving for retirement. 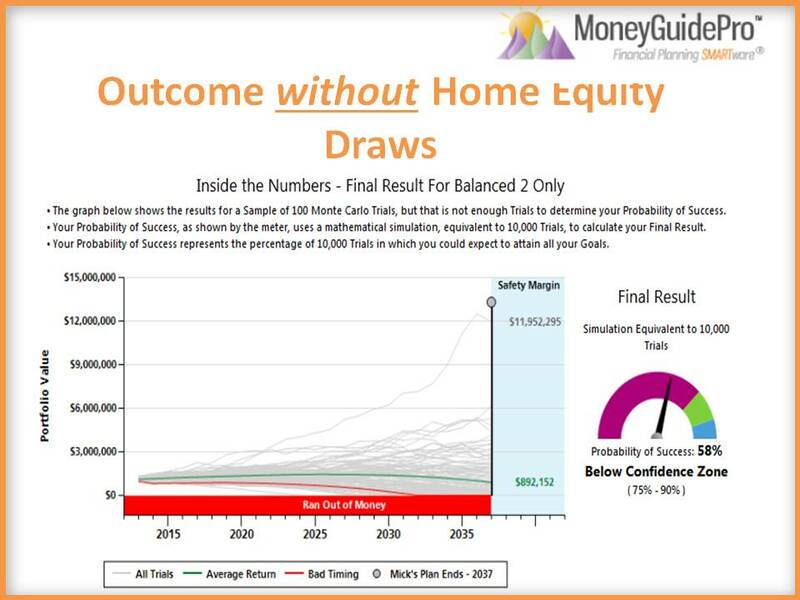 However, the financial planning analysis software after looking at all their numbers and running 10,000+ simulations predicts that their “Success” rate at 58%. That is, based on their input, they will either have to radically adjust their lifestyle or they will fall way short of their retirement goal of having enough money to last all of the retirement lives. 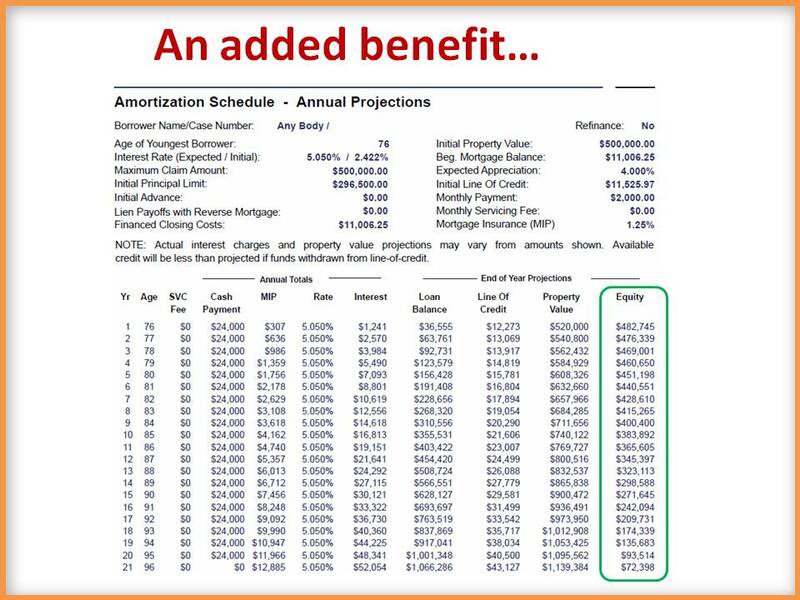 However, we now look at a borrower who chooses to implement a Reverse Mortgage and selects a monthly tenure payment of $1,200 a month (for as long as they live in the property). What is the Impact of such a strategy? Clearly their advisor has placed them in a better long term retirement position by implementing this strategy. A confidence prediction of 96% vs 58% is stunning, for such a simple implementation. However, this was precisely the conclusions that the most advisors and financial thought leaders have come to since 2011. 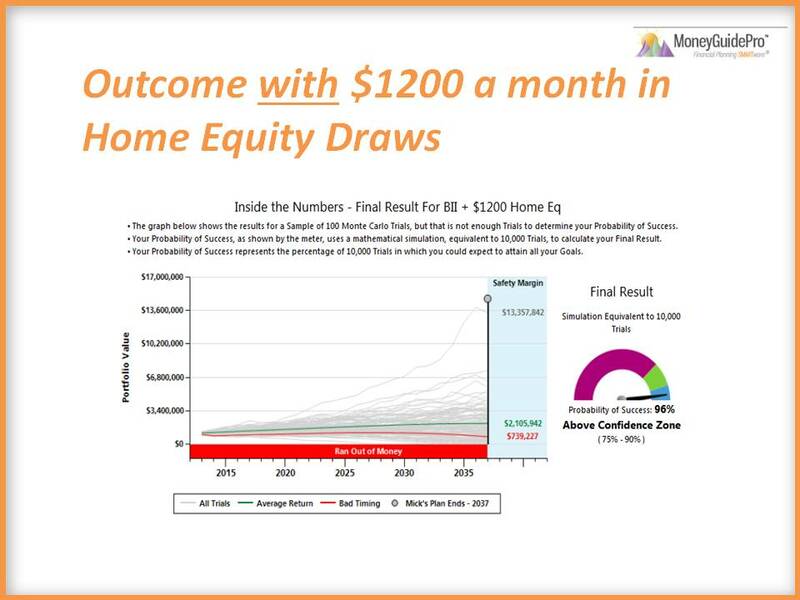 An added benefit to this strategy is that there is Equity that remains in the property. See Below. Assuming the home appreciates at around 4% (which is a conservative estimate of appreciation over a 20 year period). It shows that there remains equity in the property. NOTE: This example uses a total interest rate (Note + MIP) of close to 7%, where as total interest rates (3/2014) are closer to 4% for the standard line of credit. 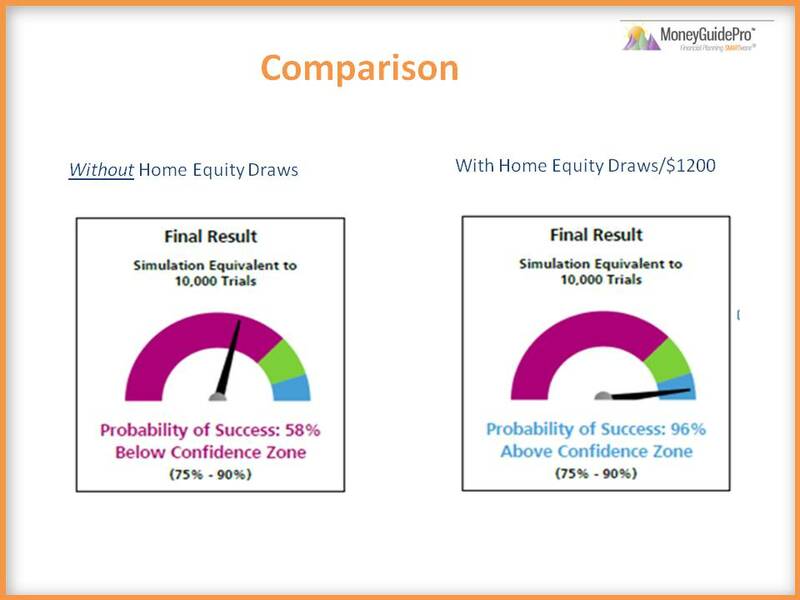 The point is that remaining equity is anticipated.